When you click the link, it takes you to Frank’s domain registrar, Uniregistry, where the visitor is given several options. In addition to a link to purchase the .com domain name from the domain owner, the visitor can also see other extensions that are available for sale, and the visitor can purchase the domain name directly from Uniregistry. I checked out a couple of my own domain names that are parked at DNS, and this link is not visible on them. My guess is that Frank is testing it to see if it drives revenue while not deterring people from clicking the revenue generating links. I would bet that he is testing this on his domain names before determining whether to introduce it to others. KneeBraces.email — that’s a good one, ha, ha. Why not KneeBraces.ceo or .guru? How about .estate? or .land? Mark, you have a way of making me LMAO. I wonder if the affiliate payment will be a one shot deal or will continue to pay out each time the domain name is renewed. I don’t know that much 😀 My guess is, it’ll be an one-off referral fee, which makes more sense. Frank emailed me and said it would pay upon renewal, too. A newbie or your average joe will click on that link thinking that he is going to purchase the actual product knee braces by emailing the owner. 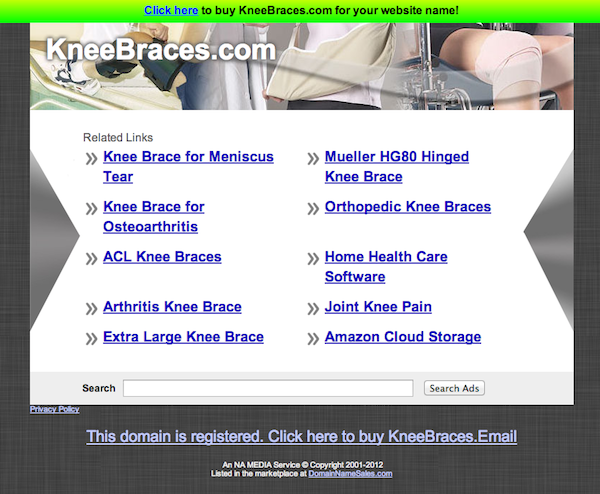 When an average joe reads kneebraces.email, he has no clue that this is an actual domain name…he thinks that by clicking this link, he is going to email the owner and purchase knee braces. Someone sent me an email trying to sell a .guru because I have a similar .com. .Email is another one of the better ones imo. Looks like Name Administration may also be forwarding domain names directly to Uniregistry. Check out Brights.com. It’s good they’re testing this with his names first. Personally, I don’t see how anything that distracts the visitor away from the seller’s desired action (clicking the link that leads to a potential sale or picking up the phone to contact DNS) is a good thing. Another thingif is that unless they apply some sort of machine-learning or highly nuanced “rules” to which gTLD extensions are applied, there won’t be any rhyme or reason to which extension shows up. .Email is a really bad example for this keyword, for instance. It’s SO bad that it might reinforce the need for the .COM. But you can’t count on that. There are bound to be some low-ballers or easily influenced (confused?) visitors who might opt for the new extension because it’s significantly cheaper. I trust Frank’s team will deliver a well-engineered, sophisticated solution, if this does test well. But I don’t really see how it’s a “win” for domain owners. if you’re trying to sell the domain why would anyone want to give a possible buyer a cheaper alternative that you would likely get paid less than a dollar in commission for? Elliot any info about this ? I called DNS about another issue, the guy I spoke to was not sure about Godaddy leaving at all – as if he had heard something somewhere about something like that happening sometime – certainly not that he was about to be unemployed. — very strange and it still is April 1.